RadDataForm provides AutoCompleteEditor which uses RadAutoComplete control on different platforms. With AutoComplete you could enable users to search for and select several items known as "tokens". 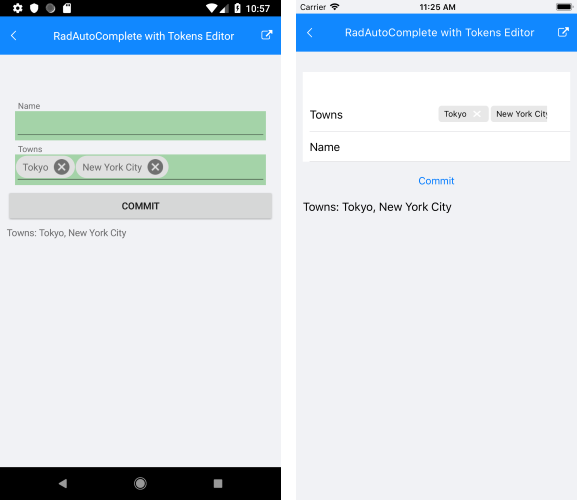 This article will show how you could enable the tokens support of RadAutoComplete inside DataForm through custom renderers on Android and iOS (tokens are not available for UWP). Finally, let's go to the iOS project. Again, add a custom renderer class where the DisplayMode needs to be set. You would also need to use a delegate in order to handle adding and removing tokens. You could find a runnable example in inside DataForm/HowTo/RadAutoComplete with Tokens Editor folder of the SDK Samples Browser application.